The Dawurske surname is a unique variation of the Slavic name Dworsky, originating in Wendisch Karstnitz in Kreis Stolp. I have spent many years researching this surname in an effort to find a connection to my own family; all have come up empty. However, in researching this specific family, I began to notice specific trends in the naming patterns. Insofar as my research has proven, anyone with a similar spelling to “Dawurske” is related to the family from Stolp. All other people with this name in Pomerania have historically come from the same place–that is, all but my family. That is not to say it is no longer a possibility, but all evidence is inconclusive. The first mention of this surname in Pommern was recorded in the 1717-1719 Hufenklassifikation. This document is the foremost resource for research concerning the concentration of family names. Seventy years prior to this census, the Thirty Years’ War ravaged Europe. The region of Pomerania was especially decimated as armies waged their battles across the land. Along with it, villages and their histories burned. Ergo, the Hufenklassifikation bears a significant weight as to the distribution of surnames; peasants and their offspring were bound to their master’s land indefinitely after the 1616 Peasant Ordinance, or more accurately put: the “Peasants, Shepherds, and Domestic Servants Decree.” It wouldn’t be until the early 1800s that most peasants would have the opportunity to leave the landed estates. As evidence by the narrative of the Dawurske family, by the early 1900s, most had left the villages of Wendisch Karstnitz and Rambow for the city of Stolp, Berlin, New York, Wisconsin, and some traveling labor from Pumlow in Belgard to Alt Paalow in Schlawe and Fehrbellin in the Brandenburg region. Dawurske, as it was standardized in German, has undergone a series of revisions over time. Some were likely due to dialectical differences between the residents and the pastor of the church. Others could easily be attributed to the prevalence of illiteracy. In any event, the name Dawurske was originally spelled as Dwuske in the Hufenklassifikation. Thirty years later, the church book of Lupow recorded the name as Dworsky. This presents two interesting arguments. The first is that the German ear must not have discerned the “r” in the name, thus rendering the sound to be more of an “-oo” (as in “who”) rather than as a long “-o” sound (such as “oar”). While the name would be inconsistently spelled, the most common variations from this region clung to the spelling with a “-ur” by the early 1900s. This leads me to believe that the surname may have come from the region near Danzig. 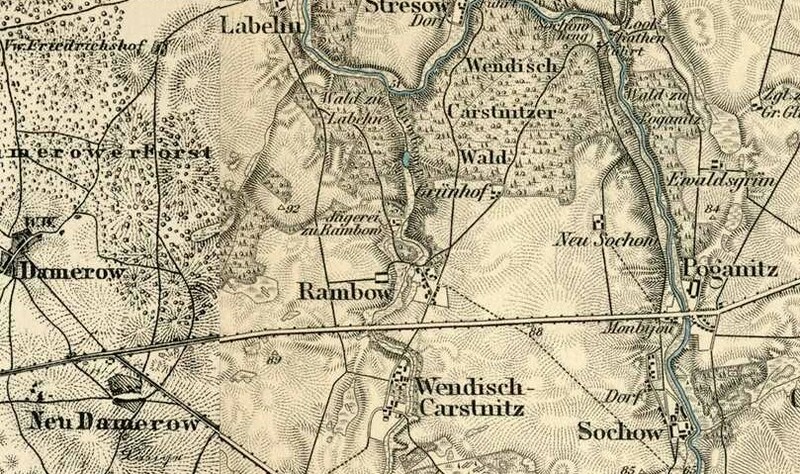 Wendisch Karstnitz was not far from the border of Lauenburg in Pomerania. This area was dominated by the earliest Slavic tribes. The ones in particular who settled in the region and persisted were the Kashubian people. The Kashubians pre-dated the Polish settlers who would arrive later on. Their culture stayed relatively unchanged, as they lived a specific way of life relying on the sea. While most areas in Poland became Catholic, the Kashubians near Glowitz would be Lutherans, even having services held in their native tongue well into the 1800s. If this were to be the case, it would explain the “-ur” sound (as is the case with the word “Dwór” in Kashubian) instead of the “-or” sound. The second argument pertains to whether or not the name is of Czech origin. Typical Polish spelling of the name should end with “-ski.” A “-sky” ending would have been standard for anyone living in the Kingdom of Bohemia. Likewise, “-skij” would denote a person from Ukraine. However, a pastor from Sachsen (Saxony) would have been more familiar with dealing with the Czech people and could have easily attributed the Czech spelling to a person from another territory, thus spelling a Polish person’s name–Dworski–as “Dworsky.” A Heinrich Dworsky von Helfenberg (1505-1582) was mentioned as an Ultraquist in Prague in numerous documents concerning his work at the Benediktiner-Klosters Slowan. Another early mention of the name was for Johannes Cornelius Dworsky von Greifenberg in 1682 (also spelled Dvorsky), whose grandfather was nobilized under Kaiser Mathias. It could be assumed this same person went by the name Johann Paul Dworsky von Greifenberg. Further documentation alludes to his confirmation of his admission into the coat of arms on May 18, 1635 in Vienna. From Stolp: Dwuske, Dworsky, Dworsken, Dwurske, Dwursken, Dworske, Dworschke, Dwarske, Dawurschke, Dawurske, Dawursken, Dewoskÿ, Dawurski, Darwuhske, Dewanske, Dawarske, Dewuske, Dawaske, Dewaske, Dawerski, Dawoske, Dewoske, Deworske, Deworski, Dawuske, Davuske, and Dewurske (other variations to this also exist). The “-e” in Dawurske was later dropped around the early 1900s by the Dawursk family who immigrated to Wisconsin. Also of mention is the name Dawosky, which has a high concentration in the Lübeck area. This family has a connection with later generations to Jewish roots. Earlier church records point to Rensefeld by Oldenberg, but it seems the family was still centered around Lübeck. Jean Nicolaus Hermann Dawosky worked as a customs assistant on the train from Lübeck. His father was Franz Anton Dietrich Dawosky, born February 7, 1815 and was from Celle, married into the Lutheran religion and was formerly Catholic. Most likely, Phillip Simon Dawosky, a Jewish doctor in Celle, was his brother. The doctor was the son of Simon David Dawosky of the Blumläger Vorstadt. I was originally directed to search for my surname in the Stolp.de Globalindex. There, using wildcard searches, I was able to create a master list of all possibly related names. By starting at the beginning of the Lupow church book and moving forwards, all closely related names as found on Ancestry.com seemed to turn up connecting results. The name, Dworsky, relates to the root wood “Dwor” in Slavic languages, as previously mentioned. Therefore, this name is in some way related to people who worked on a manor. German words that can describe this name are Verwalter and Palast Diener, or appropriately translated as administrator, steward, or palace servant. More or less, this could easily be equated to a butler. Professionally, it is similar to a Gutsverwalter, a Hofbeamter, or a Hofamtmann. More loosely translated, it means “manorial farmstead administrator” or “manorial servant.” Different variations of the surname could mean “courtier” or “aristocrat,” according to Polish Surnames: Origins and Meanings by William F. Hoffman. It should be noted that the endings that appear for this surname are subject to naming customs: -sky, -ski, or -ske for a man, -ska for an unmarried female (does not apply to the Lupow church book), and -sken or -skin to denote that person was married. However, this naming pattern was not strictly followed, and some children may appear with the -sken ending on their names at birth. From Język polski, Volumes 34-35: “In some Polish surnames, the ending -ki: Dawurske…. was changed to -ski. IV. Surely, later, from the Słupsk area, a good Germanization of the Lębork area…” Apparently, the name caught the attention of Towarzystwo Miłośników Języka Polskiego in the 1950s. After three years of work collecting information on this family tree, I will be publishing my work to hopefully help others connect with their family roots. It must be noted that there was significant difficulty concerning two names: Hans Gergen/Johann Georg and Catharina. The problem here lies in the fact that numerous people in the early church book were given those names with few clues as to who died or married. Birth dates are certain, however, it was a problem pinpointing individuals with exact certainty. Logical rules of modus ponens and modus tollens were applied to the process of elimination, circumstantial evidence, and potential immediate relatives based on godparents. Regardless, there must exist errors in my work, as it is entirely possible the pastor made mistakes in his duplicate copy of the church book. Doubts will be thoroughly examined to help further researchers with a full picture of the evidence. Each line will be explained at length. When all have been compiled and published, they will be linked to this page as an index. This is one chapter in a ten-part series. To read more about this surname study, please see the index to the entire series, "Dworsky and Dawurske Family Tree and Surname Series." I founded this website to help others make connections with their genealogy. I've been at my own family history since 2014 and have made significant progress since then. My hope is to one day determine where my family name came from. I was informed I should look into Kreis Stolp, and I was surprised to discover a treasure trove of names that matched mine! Unfortunately, no connection has been proven to this branch. If a DNA connection were to be found, I would gain a much better perspective of where my family name originated from. Although I no longer believe my surname originates with the Dworsky family from Wendisch Karstnitz and after spending three years assembling this family tree, I decided I would share what I have worked on to help others who might be researching this same family.